The sets linked from this page are similar to certain popular handwriting styles. View the images of the styles below, choose the set that most closely resembles the handwriting style that you need. The Gigantic Printable HWoT Handwriting Set that goes along with Teach Your Child to Read in 100 Easy Lessons. 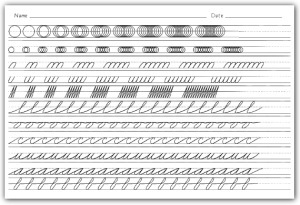 The worksheets for DN style are sorted by rule heights. Parts of this set require a subscription. 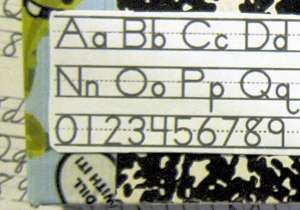 The handwriting printables offered in ZB are arranged by letter. The ZB sets are new and at this time, I have beginner worksheets. Each worksheet has two lessons. The upper and lower lessons are the same. This style, ZB, resembles Zaner-Bloser. Parts of this set require a subscription. We, I, have made "ruled president paper." As you might guess from the title, the paper is ruled and includes a picture of an American president. The paper is available in two styles - 1. with no numbers and 2. with numbered rule. Choose a handwriting style, print the file, cut out the strips, glue them to your children's notebooks.